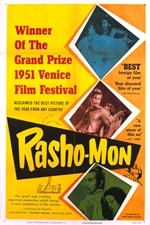 Rashomon is a 1950 Japanese period drama film directed by Akira Kurosawa, working in close collaboration with cinematographer Kazuo Miyagawa. It stars Toshiro Mifune, Machiko Kyo, Masayuki Mori and Takashi Shimura. The film is based on two stories by Ry?nosuke Akutagawa: "Rashomon", which provides the setting, and "In a Grove", which provides the characters and plot. The film is known for a plot device that involves various characters providing alternative, self-serving and contradictory versions of the same incident. Rashomon marked the entrance of Japanese film onto the world stage; it won several awards, including the Golden Lion at the Venice Film Festival in 1951, and an Academy Honorary Award at the 24th Academy Awards in 1952, and is now considered one of the greatest films ever made.